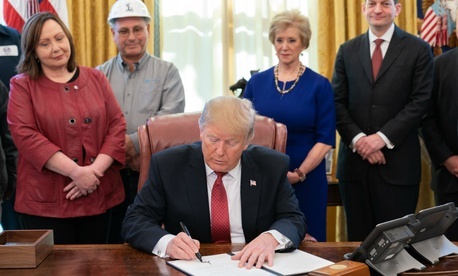 The directive to agency heads builds on an April 2017 “Buy American and Hire American” executive order issued at a time when the Trump administration was expected to press for a major boost in infrastructure construction, which has yet to materialize. Within 120 days, each agency head is to identify any “tools, techniques or conditions that have been used” and report those, along with a planned strategy, to the president and the U.S. Trade Representative. Covered programs include those involving “alteration, construction, conversion, demolition, extension, improvement, maintenance, reconstruction, rehabilitation, or repair of an infrastructure project in the United States,” the order said.